Wilhelm Dehler purchased the doll factory of Karl Witthauer in 1872 and produced bisque head dressed dolls until they went bankrupt in 1894, they were located in Neustadt near Coburg, Thuringia Germany. Dehler's dolls were distributed by J. F. O. Michaelis of Paris, France. Dolls were also exported to the USA and England. 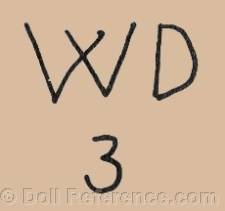 Dehler dolls are believed to have been marked with the initials W. D. and a size number. 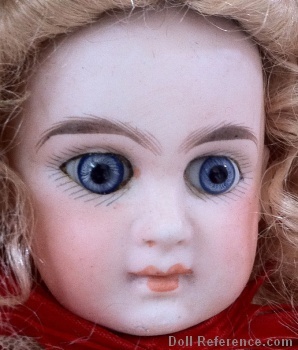 Shown on left, a poured bisque socket head doll with open crown, sleep eyes, delicate painted eyelashes, feathered brows, closed mouth, pierced ears, wigged, jointed composition body. See below for the doll body and Dehler doll mark.